After seven years heading the police department in Cheney, Chief Jeff Sale, 54, is leaving to become the chief of police in Bend, Ore.
“I put in an application and made it in their top five, so I did more research on them and I was quite impressed with the city and the police department,” Sale said. 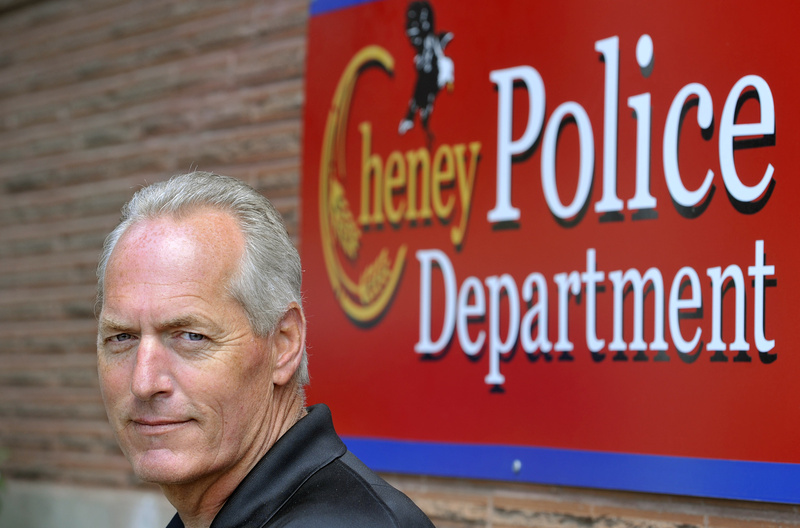 Sale came to Cheney after working for the Washington State Patrol for 25 years. Before that, he worked for the Moscow Police Department after working for the Colfax Police Department for a short period of time. “From the time I was in about the sixth grade I knew what I wanted to do and I wanted to go to work for the state patrol,” he said. Over the years, Sale has brought around $2 million in grants to the department and the city of Cheney, not including a lot of donations. One of those donations is Kira, the city’s bloodhound. Kira and her handler, Officer Zeb Campbell have not only been tracking missing people – whether they are dementia patients, missing children or crime suspects – but have recently been deployed to work on marijuana eradication. Campbell and Kira hang from a cable on a helicopter and are lowered into grow areas to track suspects. Sale also served as the city’s interim city administrator before Arlene Fisher was hired. “It was interesting,” he said. “I learned more about water usage and equivalent residential units for water and wastewater.” At the time, the city’s growth was outpacing its water capacity and a moratorium was placed on new construction. It was under Sale’s watch that the police department began neighborhood policing; the city was divided into seven sectors and an officer assigned to each one. That officer is on call to hear residents’ concerns about problems in their own neighborhood. That project is continuing today with the department’s community outreach. Every year the police hold the annual Cheney Pride Day, a citywide beautification project to clean up neighborhoods in the spring. After the cleanup, participants are invited to a barbecue. The department’s interest in barbecue has led to a new project this year: The department took a surplus patrol car and turned it into a barbecue pit, most recently competing in a cook-off two weeks ago during the Cheney Jubilee. “My pork shoulder took seventh out of 20 teams,” Sale said. Sale was able to get some funding for the project from the old DARE program. The car was taken to Spokane Community College’s auto shop, where students stripped the car of its parts and kept what they needed for their own supplies. Then the car was taken to Cosmic Iron, which put a fire box in the trunk and turned the passenger compartment into a smoker. It is large enough to hold about 30 chickens or about 20 pork shoulders. The department has seen a number of departures this year, most recently when Lt. Dave Mather left to become the executive director of the Small Rural Tribal Border Resource Center. Sale said the department is dealing well with the transitions. Sale’s last day is Monday, and he’ll start his new position in Bend on Aug. 1. Bend is much larger than Cheney, with a population of about 80,000 and a police department of around 110 employees. Cheney has a population of 10,680 and the police department has about 20 employees. As the city starts its search for a new chief of police, Cmdr. Rick Campbell will serve as the interim chief. Sale is proud of the progress both the city and the police department have made over the last seven years.